How does a former fashion stylist turned decor guru — with kids, no less — outfit her home? Just like how you imagined...but better. Thanks to POPSUGAR Home, we peeked inside HomeMint cofounder Estee Stanley's gorgeous L.A. digs — and, not surprisingly, the design is worth your ooh and ahhs. At first glance, we have the sophisticated touches one would expect from Justin Timberlake's decor partner: neutral palette, European-inspired design, antique rugs, and well-curated art. But, then, there are the surprisingly whimsical-yet-practical elements that would work for any family size: a mosaic kitchen table, supple leather furniture, and kids' rooms equipped with a tepee, birdhouse lights, and classic accents. 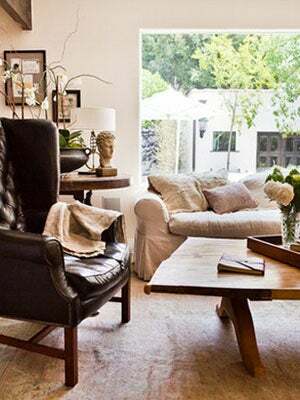 The end result is a breezy, inspiring home that is equal parts chic and comfy. For the full house tour, head over to POPSUGAR Home. Photo: Courtesy of Laure Joliet/POPSUGAR Home.